This week we travel to Milan for Molinelli's relic recipe. This "Molicaster" looks like a Creme Brulee approach. I imagine them coating it with sugar and carmelizing it with a torch. 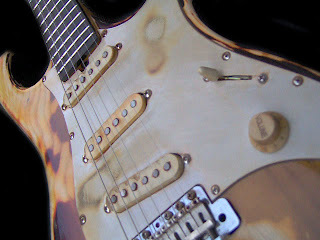 See the torch marks on the pickguard and gooey colors. Last week's relic from Van de Haar in Holland resembled a partially smoked Texas brisket, so it's only fitting that today we feature a dessert Strat.